Deer hunters have a bit to think about over the next couple of months as state wildlife biologists finish gathering data from surveys sent out to just over 4,000 hunters asking if they support expanding antler point restrictions (APRs) throughout the Lower Peninsula. Two new proposals are on the table for 2014. If approved – and that is a long way from being decided – the deer hunting landscape will change drastically in the Lower Peninsula. It is up to deer hunters to decide whether for better or worse. The proposals were brought to the Michigan DNR by an organized group called the Lower Peninsula Deer Management Initiative. Its members support passing on smaller bucks and shooting only larger and older deer. They contend that bigger deer and healthier herds will follow – in turn, keeping hunters interested and returning to hunt. That is good for the economy and for deer hunting. Their proposals affect the northern Lower Peninsula, what is known as Zone 2, and the entire southern portion of Michigan, known as Zone 3. APRs are now in place for 13 northwest Michigan counties and Deer Management Unit 487. The proposal would expand APR use to the rest of the NLP. 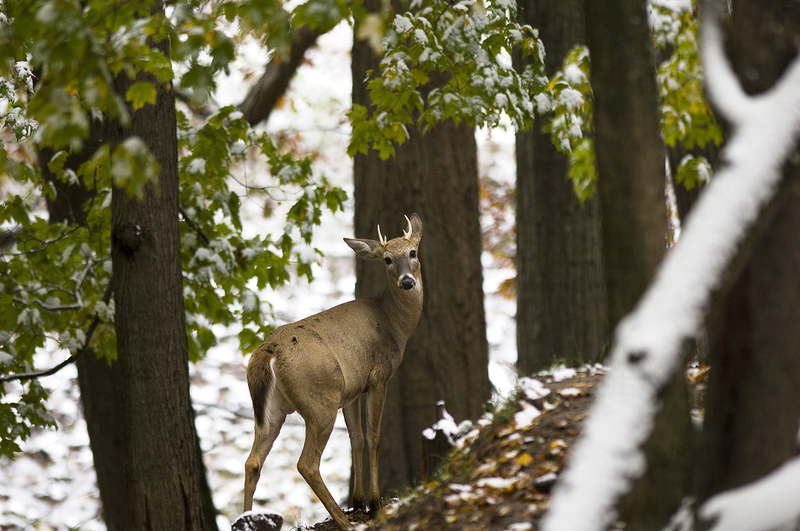 If adopted, NLP hunters would be prohibited from shooting a first deer with fewer than three antler points on a side. A second buck would have to have four points on a side, which is already required. Southern Michigan hunters would only be able to shoot deer with four points, or more, on a side. Young hunters using mentored youth or apprentice licenses would be exempt when hunting during the designated youth season. More details are available at: Michigan.gov/dnr. Type APR into the search box on top. The change would, no doubt, be huge for Michigan – where younger bucks are the majority of what is killed. But would it result in the change that the LPDMI purports? The voices are loud on each side of the debate, but wildlife biologists are uncertain. More rubs and scrapes? Yes. But research to date has shown no difference in conception rates, according to Rudolph, which is what proponents suggest. The theory is that rutting and breeding is suppressed in younger bucks when there are more dominant, older bucks on the landscape passing on their genes. Some, like Tom Harmon, a reader in St. Helen and a lifelong deer hunter, is simply against mandatory APRs. What really got under Harmon’s skin was learning that out-of-state hunters were having a say about the proposals. Harmon’s cousin lives in the state of Washington where he received a Michigan APR survey. He comes back to Michigan to hunt every year with the family. Harmon believes no out-of-state hunter should have any right to comment. “They should have zero input or vote on these important issues of how deer are killed and harvested in Michigan,” Harmon said. DNR wildlife officials say non-resident hunters may well have an opportunity to express their views if they are randomly selected to participate. The survey approach was developed to provide a consistent and random sampling of hunters in the proposal areas. The survey results go members of the Natural Resources Commission – something expected this spring. Approval requires a 50 percent participation rate and 66 percent approval by hunters. “Silverdeer,” another reader, is on the fence about APRs. He said: “I like the fact that you are going to see larger bucks with larger antlers by instituting this rule. However, there are two reasons that I don’t like it. One is that youth hunters should be allowed to disregard the APR as it will really limit things for them. The second, and I think more importantly, is if people are just hunting for a set of antlers, I feel that they are hunting for the wrong reason. This entry was posted in Uncategorized and tagged Conservation, Deer, DNR, Hunting, Michigan Department of Natural Resources, Wildlife. Bookmark the permalink. If this winter keeps up the APR people are going to get their wish. No one is going to shoot a spike next year because the yearling population is going to be devastated. Nice objective article Howard, It’s good to see an article written about these APR’s where you can’t tell where the author stands on the issue. Deer hunting is not something you come into at the top. It takes a lot of time, patience, experience, and skill to hunt deer. What percentage of these people pushing for mandatory antler point restrictions have not shot a small buck? It’s don’t do as I did, do as i want to do now. Just a bad idea, period. Thanks Dale. Appreciate the feedback and hearing your thoughts on APRs.